Blurb: When a magical black cat, Surla, runs away from her bombastic witch, she has no idea she will soon be living the life of shy teenage girl, Cathy Phillips confronting the mean girls and cute guys of Washington High. 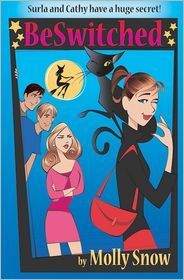 Cathy’s peers notice a dramatic change when she starts standing up for herself, dressing differently, snagging dates and picking up feline habits. Meanwhile, Surla’s witch is a flaming red-haired fury, awkwardly trying to fit into society, so she can find her familiar and perform magic once again. The “curse” of being BeSwitched may just be the most purr-fect secret these new best friends could ever have! Cathy (...) almost running into a tired black cat. "Poor thing!" She jogged over to it as it sat there frozen shocked. "Are you al-" Cathy couldn't finish her sentence. A weird sensation flowed through her body, making her unable to speak (...). Then, the feeling diminished and she was looking up at herself. My thoughts: Well, BeSwitched is a book where I do not know what I could say for, but READ it and you will love it as much as I do. It's a short but fantastic book that entertain you very well. BeSwitched keeps some meaningful lessons a lot stuff to think about ready. Surla is a black witch's cat, you know this is a magical book. And of course it is, not only in its content rather in its ability to fascinate the reader. The two main characters are more different as they could be. Well Surla is a few hundred years older than Cathy. For both the curse of being BeSwitched isn't only the most "Purr-fect" secret they could have, it's a chance for both as well. Surla makes Cathy become a more confident person and Surla's circumstances change for the better as well. I don't want to betray more about the content, find it out! This book is so cute and exciting. The end so unpredictable and more than exciting. Take you some time, two or three hours in the afternoon and read this book, it's fun.